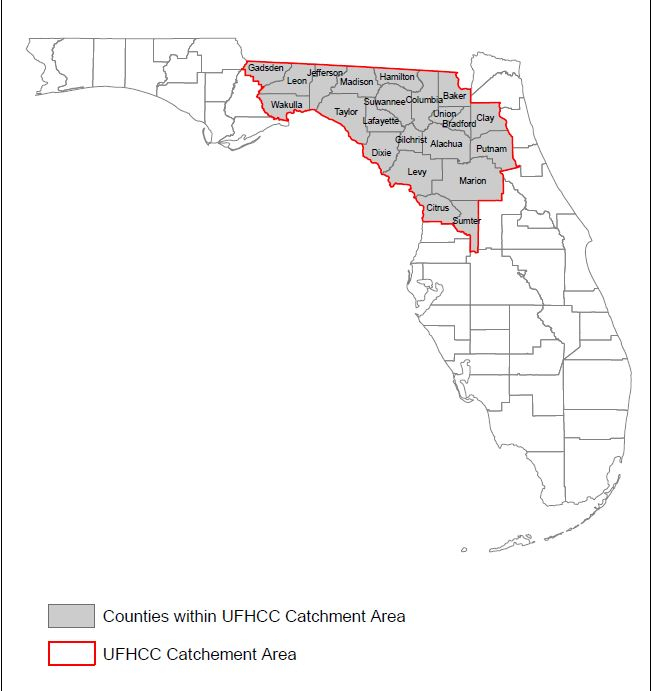 The UF Health Cancer Center is dedicated to serving the residents of Florida, which is the state with the second-highest cancer mortality rate in the nation. Cancer is already the leading cause of death for Floridians, and the age group that bears the greatest cancer incidence — those who are age 65 and older — is projected to grow by 25 percent over the next two decades. Therefore, our efforts to serve our state with innovative research and leading cancer care have never been more critical. 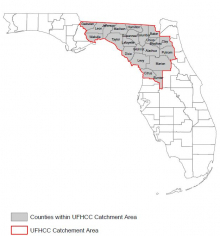 This map shows our catchment area, the counties that 85 percent of our patients call home. These counties face unique challenges of the cancer burden, and it’s our mission to address those challenges by developing creative prevention and treatment strategies that serve our rural, elderly and diverse population.